To view our current inventory of Naval swords, flintlocks, and other antique and Civil War weapons, click here! This Very Rare Documented Sword Has Been Sold. Thank you! Discussed and illustrated in Mowbray's, The "American Eagle-Pommel Sword"! 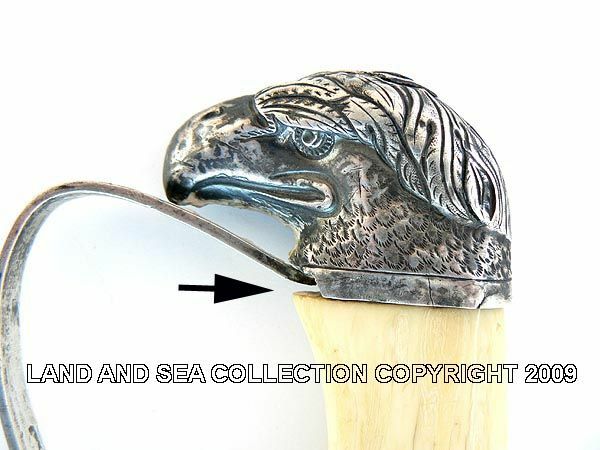 DIMENSIONS: Length overall 37" Length of blade 31 1/2" Width 1" Thickness 1/4"
Presented is a very rare example of an officer's heavily plated Silver eagle head spadroon type straight sword with a unique pierced guard having a spread crested eagle in the center. Mowbray attributes this and others in this style to the little known cutler, Solomon Jackson of Birmingham, England. It follows their practice of using silver wash or silver gilding over brass on this style sword, all of which he dates to Ca 1810. The plating on this sword is so heavily applied that it looks like a true Silver hilt. But careful inspection under a powerful magnifier shows a slight loss of silver in a few places with brass underneath. The loss of silver where only the slightest trace of brass is showing is on the hilt at the high point of the cross guard where it sat at the wearer's hip, at the flat sided ferrule above the guard, and on the obverse on the face of the quillion. Similar traces of silver loss are found on the reverse of the mounts. Overall, there is about 99% of the silver plating remaining so that under normal circumstances and light, this sword will appear to be a true Silver hilt. THE PIERCED GUARD: The pierced eagle in the guard has a banner consisting of five round beads above it, and four other on one side and five on the other. This treatment is discussed in detail in The "American Eagle-Pommel Sword" by E. Andrew Mowbray, who refers to the beads as representing stars and concluded that they have no significance in dating the swords. We are not so sure of that. We agree that after some point adding stars becomes physically impossible and maybe the correct cutoff point is 15. That said, setting Mowbray's conclusion aside, Vermont was the 14th State admitted into the Union on March 15, 1791. There are also six stars on the blade in one group and 8 stars in the other totaling 14 which makes us believe this sword is celebrating that event, and was made shortly after 1791. Solomon Jackson is known to have made a number of different variations of this design with a pierced crested spread eagle appearing as langet and on the cross guard. This sword exactly follows the examples in his book which include two examples that were 28 inches in length and were classified as artillery or naval swords. The added length of this sword suggests it was for a cavalry or mounted artillery officer. Page 109 in Mowbray's showing the same pierced guard, but with 15 stars on the band and blade. THE SCABBARD: The black leather scabbard is cleanly broken in the center and could be glued back together. The silver plated mounts have some dents and discoloration. The metalwork has been reattached and pinned at some later time and there is old hand stitching for four inches above the drag. There is an approximately 3/8 inch piece of leather missing from the very end. The scabbard is otherwise complete with its silver mountings, excluding the tip, all of which are engraved on the obverse side only. The leather body shows cracking and crazing overall, but the stitching is all present and tight.